Enjoy vegetables during the holiday season with roasted versions of autumn’s best offerings. Seasonal squash caramelizes while it roasts sweetening any appetizer buffet. Paired with the herbed aioli, these vegetable offerings really stand-out. 1. 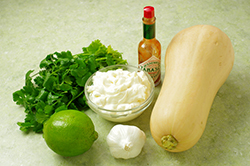 Whisk together all of the aioli ingredients in a bowl; store in the refrigerator until ready to serve. 2. Wash the squash well. Cut both ends of the squash to create a flat surface for cutting. 3. Peel the squash with a vegetable peeler or knife. (One minute in the microwave will make peeling easier.) Cut the peeled squash just above the bulbous portion, then in half lengthwise. With a spoon, scoop out the seeds and membranes. 4. 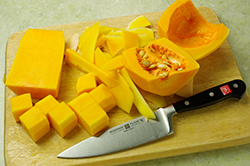 Slice the squash in 1-inch slices, then cut into evenly-sized cubes. (The squash pieces will shrink in size during roasting.) Toss the diced squash with 2 tablespoons of olive oil until coated. 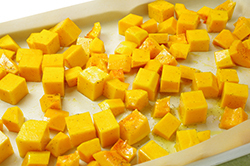 Spread the diced squash in a single layer on a lined or oiled baking sheet. Avoid over-crowding on the pan so that roasting (instead of steaming) can occur unimpeded. 5. Roast the squash in a 400°F oven for approximately 30 minutes, or until the squash’s surfaces become slightly caramelized. 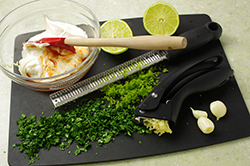 Every 10 minutes flip the diced squash with a large turner. Actual roasting time may vary according to the size of the dice and the density of the pieces on the baking pan. 6. Allow the squash to cool. 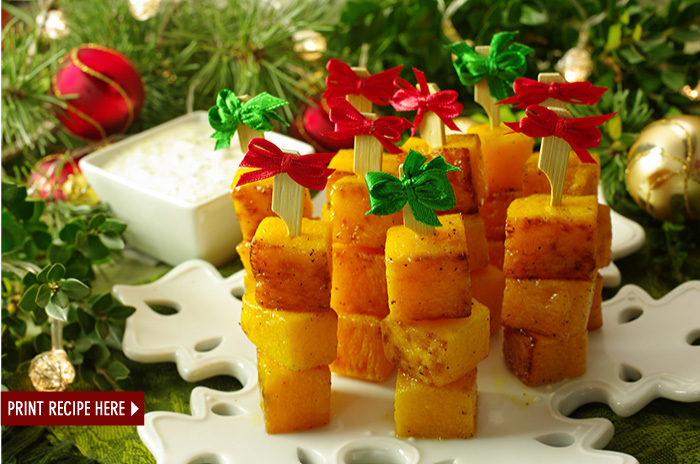 Skewer the squash pieces with toothpicks and serve with the herbed aioli.